There is a wonderful spot west of the city of Frankfurt in Germany. It’s in an area well known for its excellent white wine, its charming hilly landscape, and its welcoming people. It’s called The Rheingau. Once you make your way up a hill from Rüdesheim, maybe comfortably using the cable car, a fantastic view over the river Rhine opens up. From there, the Niederwald landscape park, you can see for miles to the West, overlooking the tranquil Rhine valley and even have the illusion that you actually see France. 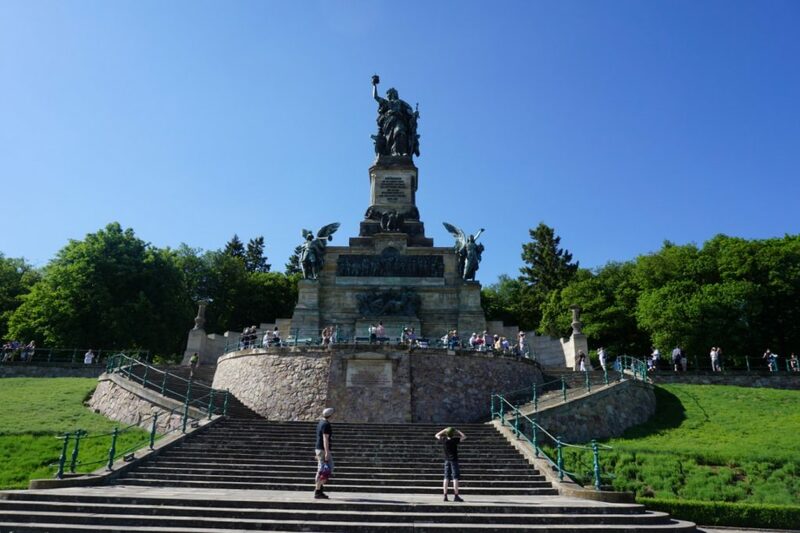 When I was there not long ago my daughter asked me about the statue named Germania that is hovering over the platform where people are gathering for the view. The 34-foot figure is called Germania. In her right hand the lady holds the emperor’s recovered crown; in her other she displays the Imperial Sword. I explained that the monument’s message was not a peaceful one. Only a few years before the inauguration of the statue in 1883, Prussia had just fought another war with France, uniting the German princes for the first time into a single nation state. The Germania was nothing else but a warning to the French: Stay where you are, don’t even think about coming here. This is ours. My daughter was bewildered. War with France? Of all countries? War with our best neighbor, friend, and closest ally in the European Union? I had to smile – and thought that maybe those historians are wrong who believe that nations always fall into the same trap. After so many bloody wars between Germany and France, both countries finally did the right thing after the carnage of the Second World War. They learned from history – thanks to the prevailing of reason and thanks to Charles de Gaulle and Konrad Adenauer. The French President and the German Chancellor turned from arch enemies into friends. This seems to have worked so well that even a 17-year old today could not believe that a little more than 70 years ago things were just the opposite. Nations time and again reach certain milestones, and their leaders have to make far-reaching decisions. Luckily, they are not always about war and peace. Mostly making choices whether to turn left or right at a historic junction are much more profane – or at least they look profane. Nonetheless they often have a lasting impact, and it takes some wisdom to do the right thing. Withdrawing from the Paris Climate Accord is such an example. The U.S. under its President Donald J. Trump has decided to make a turn, to exit the road the nation was on. Trump probably truly thinks that this decision is good for business, for employment, for his job approval, for his re-election. He thinks of the short-term benefits this move may produce – for him, his administration, and his electoral base. He does not bother about what one or two generations ahead a 17-year old may think of it. He follows the pattern après moi, le déluge’. In other words: I don’t care what happens once I am gone. Trump, of course, is not the only politician to act that selfishly. Our democratic systems with elections every four or five years makes it difficult for political leaders to withstand the temptations of reaping the low hanging fruits. Although in this case, the decision is particularly hard to comprehend. Committing to stop global warming is a win-win situation – even if you think that climate change is a hoax. Why? If climate change were man-made, reducing CO2 emissions obviously is the right thing. And if global warming, in fact, is the fate of the earth no matter what, then we all might find out too late to reverse course. Two of my favorite books are Why Nations Fail and Collapse, written by Daron Acemoglu/James A. Robinson and Jared Diamond respectively. The authors collected examples of historical crossroads at which leaders took the wrong turn eventually brought about catastrophes even though they knew better. One case study is the demise of the Easter Islands in the South Pacific. According to Diamond, the tree-covered island was destroyed by Polynesian colonists. They cut down the trees and used them to put up massive statues in order to worship their religious cult. As deforestation worsened, the islanders tried to appease their gods by erecting even more statues. In the end, the vicious cycle of human stupidity led to catastrophe. Jared Diamond finally writes: “I have often asked myself, ‘What did the Easter Islander who cut down the last palm tree say while he was doing it?” Like modern loggers, did he shout “Jobs, not trees!”? Or: “Technology will solve our problems, never fear, we’ll find a substitute for wood”? Markus Ziener is an author and professor of journalism at the University for Media, Communications and Economics (HMKW) in Berlin. Prior to that he was the head of the op-ed section of Handelsblatt, Germany’s leading business daily. From 2006 to 2012, he served as head of the Washington bureau of Handelsblatt.